The United Nations has increased its worldwide efforts to promote sustainable development. 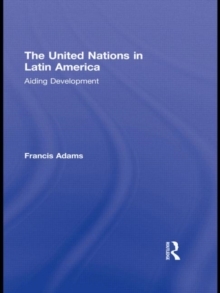 In this book, noted scholar Francis Adams examines the United Nations' actions in Latin America, particularly in light of meeting basic human needs, promoting gender equity, and preserving natural environments. While previous books have focused on a single UN agency, this book is the first to analyze the development work of various UN institutions and agencies that sponsor economic and social programs in the developing world as well as the UN's various funding initiatives, global conferences, and institutional goals. This book will be a necessary addition for students and scholars of Latin American politics and Development.